Chilli chicken is the most popular dish in Indo-Chinese cuisine as a starter or appetizer. The recipe which I am sharing with you is a dry version, which can be served as a starter. 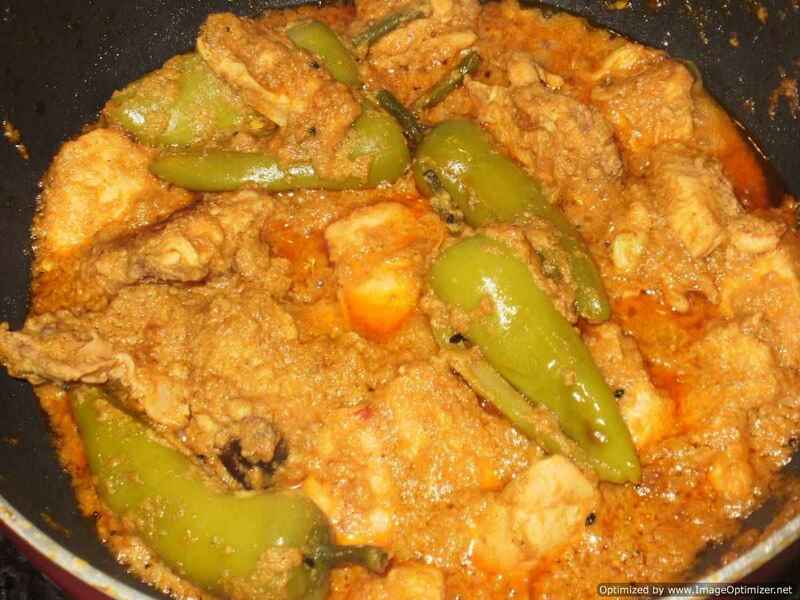 I have tasted chilli chicken in many restaurants where they serve Indo-Chinese, everyone has their own recipe. Some tastes hot, sweet as per their preparations. Vegetable Manchow soup famous as a street food and can find this in every restaurant menu now days in Indian Chinese cuisine, which is hot and sour. Every one prepares Manchow soup, their own way; I have prepared it my way. Manchow soup is spicy and always garnish with fried noodles on top. Vegetable hot and sour soup, an indo Chinese, the most famous and very popular in every restaurant. Vegetable hot and sour soup, which is spicy and sour, can be prepared easily and quick at home, if preparation is done earlier. For any soup we need a good stock and the soup depends on it. You can prepare stock at home or store bought or just you can use the stock cube. I have prepared this soup as spicy, sour and salty as per my taste. Chicken hot and sour soup, an indo Chinese, the most famous, one of my favourite soup and very popular in every restaurant. chicken hot and sour soup, which is spicy and sour, can be prepared easily and quick at home, if preparation is done earlier. Chicken hot and sour soup my favourite, it has to be hot and sour. Schezwan vegetable fried rice prepared from my home made schezwan sauce. Schezwan vegetable fried rice, I have prepared it Indo-chinese way and as per my taste. In chinese cooking for schezwan recipes, schezwan peppercorn are used which look like black peppercorns but its colour is dark in pink. But in indo chinese preparations, it is prepared differently. 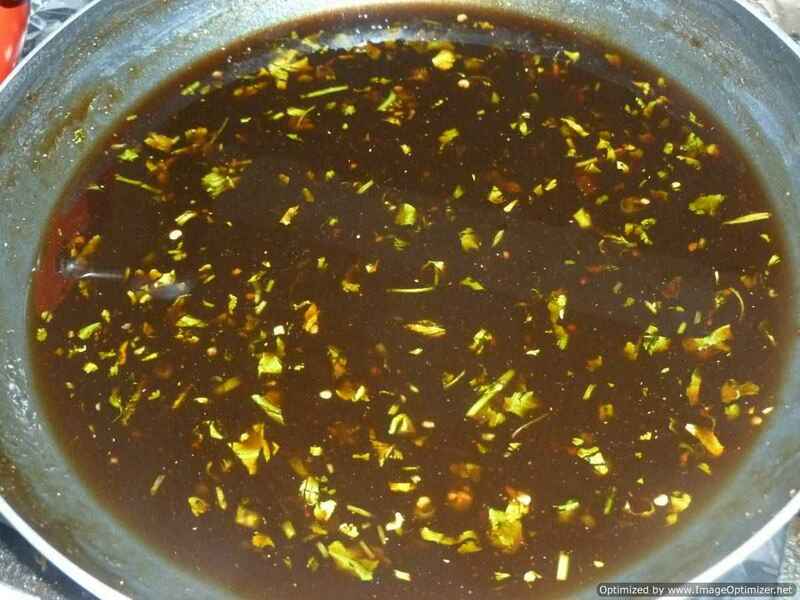 As in indo Chinese, schezwan sauce is prepared which is spicy, hot, tangy and sweet, but every one prepares it differently. Szechuan chicken is a very popular dish in restaurants features in the menu of every Indo-Chinese restaurant. It is entirely different from the Szechuan peppers. I prepared Szechuan chicken as per my style with my home made Szechuan sauce made with celery. The szechuan sauce was very delicious and gave me very good colour as you would see in a restaurant. Egg fried rice is a popular Indo Chinese food. Egg fried rice with addition of vegetables makes this dish more nutritious and healthy. There are so many variations in fried rice; each fried rice has a unique flavour and taste. You can use any vegetables like carrot, cabbage, capsicum (any colour), beans, beans sprout and peas if you like. In this you can add cooked chicken, prawns and eggs also, vegetarians can use only vegetables. Vegetable fried rice is a popular Chinese food. Vegetable fried rice is a mixture of vegetables and rice, cooked with Chinese sauce and served hot. But I have cooked it in an Indo–Chinese style. Whenever we order Chinese food, fried rice is a must, for cauliflower Manchurian or chicken Manchurian etc. Vegetable fried rice is easy, quick, and healthy and everyone’s favourite. Vegetable fried rice best made with left over rice in fridge. Chicken lollipop is every ones favourite dish; it is eaten as a starter. Chicken wings are used for chicken lollipops, which are shaped in the form of chicken lollipops. I have tried so many variations, and I liked all and I am confused to tell which one was more tasty and crispier. In this I have used chicken wings, which are in the form of chicken lollipop but not trimmed properly as a chicken lollipop, it looks like mini chicken legs. Egg fried rice is a very popular Chinese dish, but it has many variations. You can also add any meat you like, like chicken, prawns or vegetables like cabbage, capsicum, beans, carrot or bean sprout. It is up to you whether you want to add any vegetables or any meat. Vegetable fried rice is a popular Chinese food. But I have cooked it in a indo –Chinese style. You can have this with any side dish like chilli paneer or chicken Manchurian etc. you can use vegetables like carrot, cabbage, capsicum(any color), beans, beans sprout and peas if you like. Vegetable Manchurian is a popular dish and is liked by every one and it is served as a starter in every restaurant in India. I have prepared vegetable balls with different sauce, according to my taste. It is spicy, sour but tastes good. It is semi gravy form, but if you want it to be drier or gravy type can prepare it. Vegetable Manchurian is a popular dish and is liked by every one. 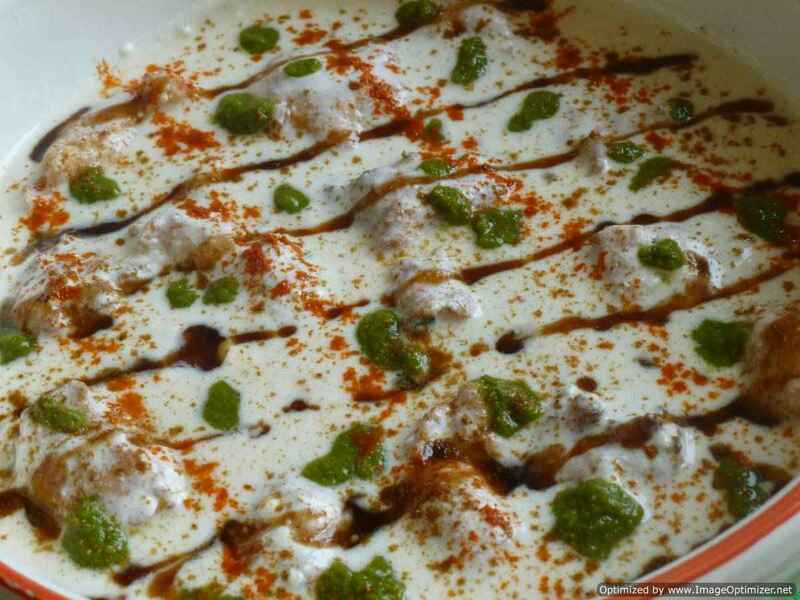 It is served as a starter in every restaurant in India. In this recipe I have used chilli paste made with Kashmiri dry chillies. I have prepared vegetable balls with different sauces according to my taste. It is spicy, sour but tastes good. I have made it a bit like a gravy, but if you want it to be drier or semi gravy, you can prepare it. Egg vegetable fried rice with oyster sauce is different from other fried rice; in this oyster sauce is added, with vegetables and other ingredients. You will find varieties of fried rice like egg fried rice, vegetable fried rice, prawns, chicken and mixed non-vegetarian fried rice, oyster sauce fried rice and many more. It is just mixing of your favourite ingredients. Stuffed capsicum with fish is an Indo-Chinese style, I liked it very much, as I have eaten chilli chicken and chicken Manchurian many times and we get it in restaurants also, which is a common and popular dish. The stuffed capsicum with fish is easy to make but little time consuming. In this fish mince is stuffed in the capsicum and deep fried and then added to the sauce. The sauce can be of your choice, you can add this to Manchurian or chilli sauce. 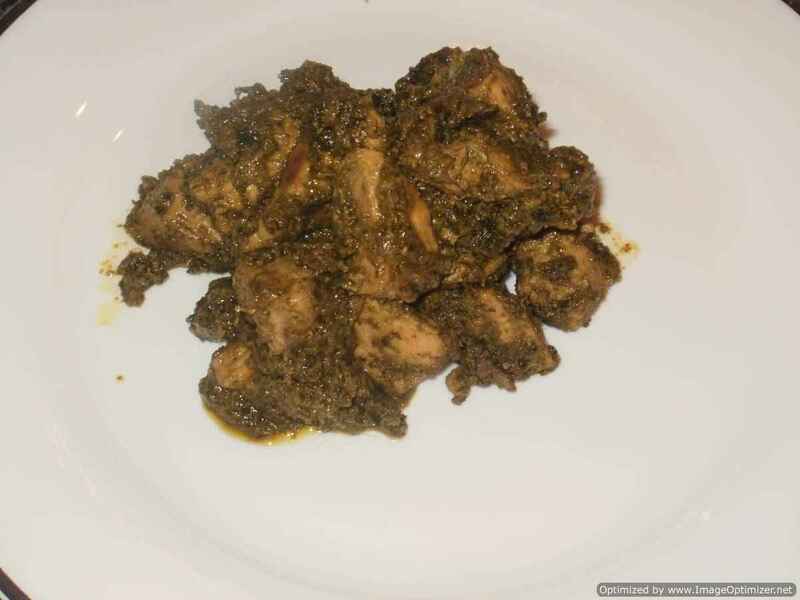 Garlic chicken is a very popular dish in India and is served in every restaurant. I have prepared this in an Indo-Chinese style, which is my favourite. As the name itself says garlic chicken, so lots of garlic goes but you can prepare it as per your taste. I have prepared many times with slight changes like adding vinegar and soya sauce and sometimes omitting it, which has given me every time new taste. The name gobi (cauliflower) manchurian is very popular in Indo-Chinese cuisine and you can find this in every restaurant in India. Gobi or cauliflower manchurian is also very popular among vegetarians. Cauliflower manchurian is made either in either dry or gravy form. Oyster sauce chicken is an oriental dish, which has a new taste and flavour of oyster. Oyster sauce is used in Chinese cuisine and Vietnamese cuisine, in soups, stir fries or as a dipping sauce and many more dishes. It is made from oysters and has a sweet taste and unique flavour. Vegetarian version is also available and is made from mushrooms. 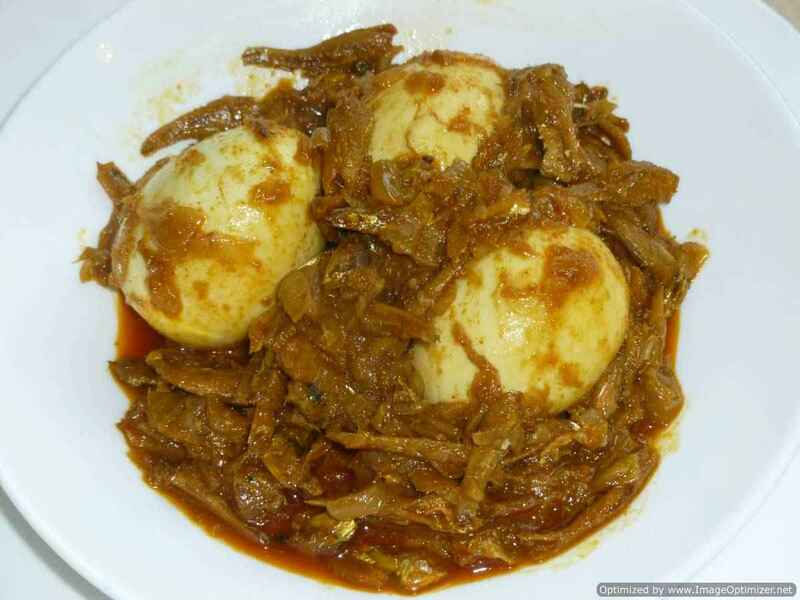 I have cooked this dish according to my taste buds. Prawn stuffed capsicum dish is quite new for me and I liked it as I it different from the other common recipes like chilli chicken or chicken manchurian. The prawn stuffed capsicum is easy to make, but a little time consuming. In this prawn mince is stuffed in the capsicum, deep fried and then added to the sauce. The sauce can be of your choice – you can add this to manchurian or chilli sauce. I have cooked the sauce according to my taste. Chicken stuffed capsicum can also be prepared the same way. For vegetarian version try paneer (cottage cheese) or combination of any vegetables. Prawns fried rice with fish sauce is different from other fried rice as in this I have not used any soya sauce and eggs also. In this fish sauce is added and some vegetables, you can add any vegetables which you like. With the same ingredients you can make chicken fried rice also. I have used small prawns and which is already boiled. This is very easy to make and gets cooked fast, if you chop the vegetables and keep it aside. Vietnamese egg rice paper rolls are so delicious that they are healthy and very easy to make. The rice papers are softened when dipped in warm water or cold water, just for few seconds and used as wrappers for our tasty, crunchy and delicious egg rice paper roll. The egg rice paper roll is filled with soft rice noodles, crunchy vegetables and lots of herbs, which makes it very healthy Vietnamese paper roll. Vietnamese prawn rice paper rolls are so delicious that they are healthy and very easy to make. The rice papers are softened when dipped in warm water or cold water, just for few seconds and used as wrappers for our tasty, crunchy and delicious prawn rice paper roll. The prawn rice paper roll is filled with soft rice noodles, crunchy vegetables and lots of herbs, which makes it very healthy Vietnamese paper roll. Chilli fish another popular Indo-Chinese dish, which can be served as a starter or side dish. When I tasted this first in a restaurant, I loved the taste, as the fish was so delicate and tasty, it became one of my favourite dish. You can use any boneless firm fish like cod or tilapia. Chilli prawn a very popular indo-chinese dish and one of my favourite starter in indo-chinese .chilli prawn is my favourite dish and I have prepared it in Indo-Chinese style. In restaurants, whenever I see chilli chicken or chilli prawns in the menu, I just order it. I love food which is spicy, tangy and reddish in colour but at the same time it has to be delicious and tasty. Gobi Manchurian is a Chinese dish but I have made it in an Indo-Chinese way. This dish is different from other manchurian dishes as I have used chilli garlic sauce and the cauliflower pieces are not dipped in the batter and fried but marinated in a dry form and deep fried in oil. I have tried so many manchurian dishes but this is my favourite amongst all. This is spicy too. You can vary the ingredients according to your taste. Chicken mince is stuffed in the capsicum and cooked in a spicy sauce. You can have it as a starter or as a side dish with rice/noodles. 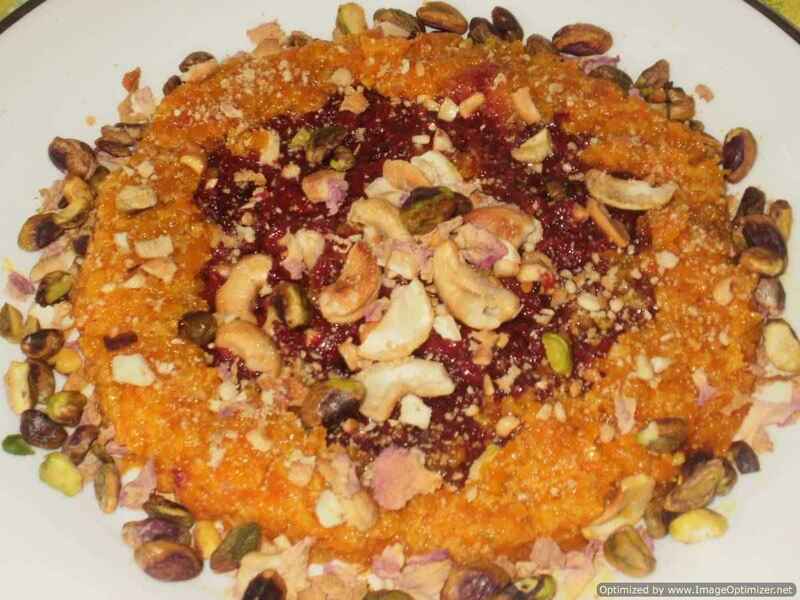 This recipe is one of my favourites and my husband likes it very much. We do not get this dish in restaurants, if at all we get it would be very rare. I tried to mix the ideas of Indian version of stuffed capsicum and chinese prawn toast. Chicken Manchurian is a Chinese dish, but I have made it in an Indo-Chinese way. In this recipe I have used boneless chicken pieces. This dish is different from other Manchurian dishes as I have used chilli garlic sauce. The chicken pieces are not dipped in a batter and fried but instead marinated and deep fried in oil. I have tried so many Manchurian dishes but this is my favourite among all. This is an Indo-Chinese apetizer and it is made from chicken wings. To give a lollipop shape, pull the thin layer of flesh to the other end of the thick bone and make like a lollipop. You can see this in my previous chicken lollipop recipes. Otherwise, you can ask your butcher to do it or is also available readymade in the market. Sweet corn fried rice, is very easy and quick to prepare. Sweet corn fried rice one of my sons favourite or which he eats probably I say, as sweet corn is his favourite in vegetables. I have used frozen sweet corn, for my fried rice. There are so many variations in preparing fried rice, you can add other vegetables and Chinese sauces as per your taste. I have prepared sweet corn as per my sons taste. Szechuan sauce is a delicious hot, spicy and sweet sauce that can be used as a dip or can be used to make delicious indo – Chinese recipe like Szechuan noodles, Szechuan fried rice and many more. This Szechuan sauce is different from my other Szechuan sauce as in this sauce I have included chilli oil(homemade), celery, tomato puri other than onion, ginger, garlic and most important red dry chillies which gives good colour like Kashmir chilli and other ingredients, which gives a different taste. The spiciness and sweetness can be adjusted as per your taste. Szechuan sauce is a delicious spicy and sweet sauce that can be used as a dip or can be used to make delicious indo – Chinese recipe like Szechuan noodles, Szechuan fried rice and many more. Szechuan sauce is a blend of onion, ginger, garlic and most important red dry chillies which gives good colour like Kashmir chilli and other ingredients, which gives a different taste. Chilli chicken has become every ones favourite and is popular in Indo-Chinese cuisine. 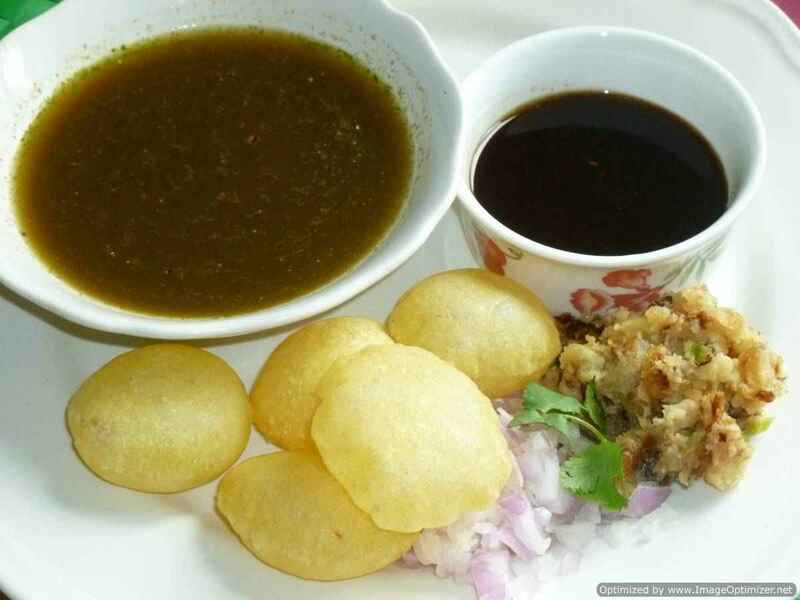 In every restaurant and fast food in India we found this dish and tastes different in each place. Vegetarians can use cauliflower and paneer. I have cooked chicken dishes in so many variations, but still craving for more variations and changes and want to know the outcome of taste. I think it is a never ending process. In this chilli chicken I have marinated the chicken and then fried separately by dipping all the chicken in the batter. Vegetarian stir fry noodles is like vegetable hakka or chow mein hakka noodles, which is stir fried on a wok or a wider Indian kadai/vessel. Stir fry noodles are very easy to make and gets quickly cooked if vegetables are chopped in advance. Its children’s favourite and of course mine too and is a very easy option for lunch boxes. The main vegetables which we see often is carrot, beans, cabbage, capsicum and beansprouts. 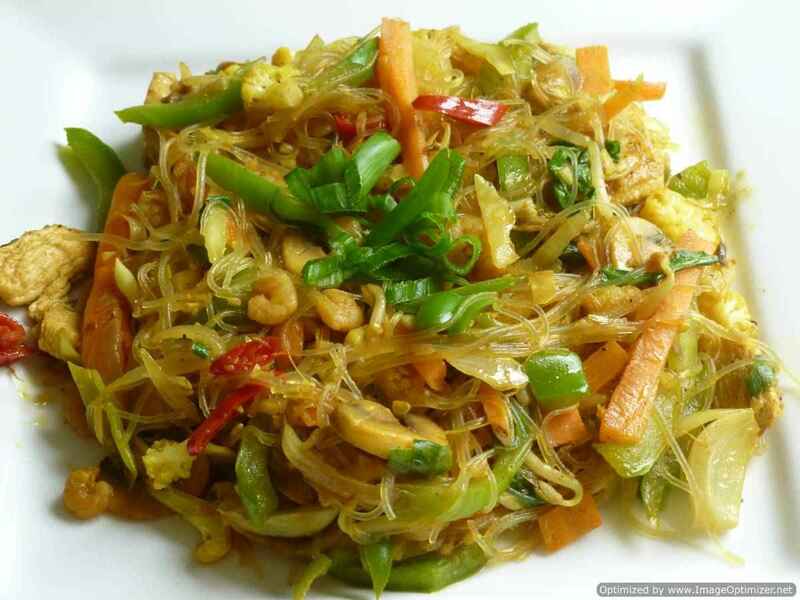 Vegetable hakka noodles or vegetable hakka chow mien popularly known dish in indo-Chinese cuisine. This hakka noodles or chow Mein noodles is all time everyone’s favourite , kids love it and is very easy to make in no time, only in vegetables cutting time is needed, otherwise its easy. Now days, chopped vegetables also you get for Chinese cooking. Its very nutrious also as lots of vegetables go in it. The main vegetables which we see often is carrot, beans, cabbage, capsicum and beansprouts. You can add any vegetables as many, as per your child’s taste, in the noodles. 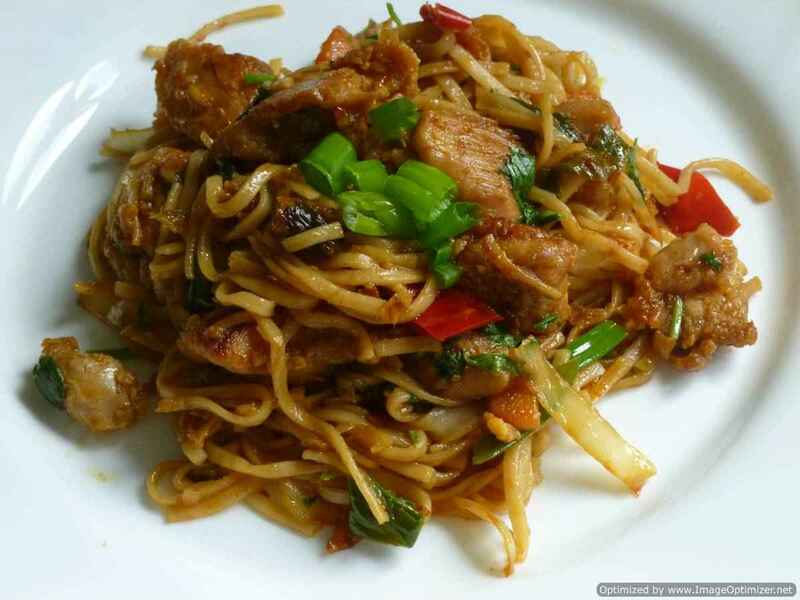 Chicken Hakka noodles or chicken Hakka chow mien popularly known dish in indo-Chinese cuisine. This chicken Hakka noodles or chicken chow Mein noodles is very easy to make, only in vegetables cutting time is needed, otherwise it’s easy. 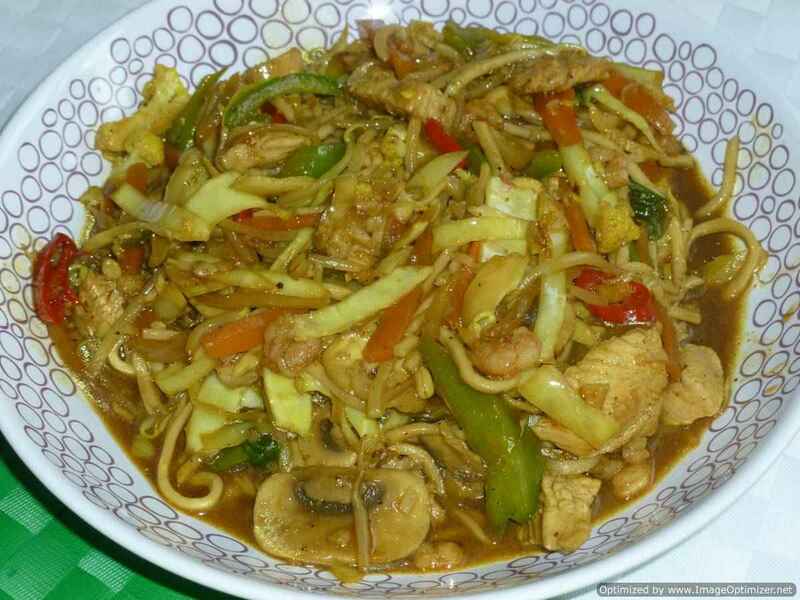 Though it is chicken Hakka noodles I have added more of vegetables, as I love to have both chicken and vegetables, but you can add more chicken as per your taste. Pad Thai is a stir fry noodle with fish sauce, chicken or prawns, lime juice, tamarind paste and vegetables, very famous as a street food in Thailand and is served with Thai condiments (crushed peanuts, chives, pickled turnip, coriander leaves, lime, spicy chili oil, chili powder, vinegar, fish sauce, sugar or palm sugar). In pad Thai, fish sauce, oyster sauce, sugar, tamarind paste, peanuts are very important but every one cooks differently as per their taste. Chicken fried rice is a popular chinese food. But I have cooked it in an Indo-Chinese style. You can have this with any side dish like chilli paneer or chicken manchurian, etc. You can use vegetables like carrot, cabbage, capsicum (any colour), beans, bean sprouts and peas. In this recipe, you can add cooked prawns and eggs too. Vegeterians can use only vegetables. There are so many variations in fried rice and you can cook according to your tatse. 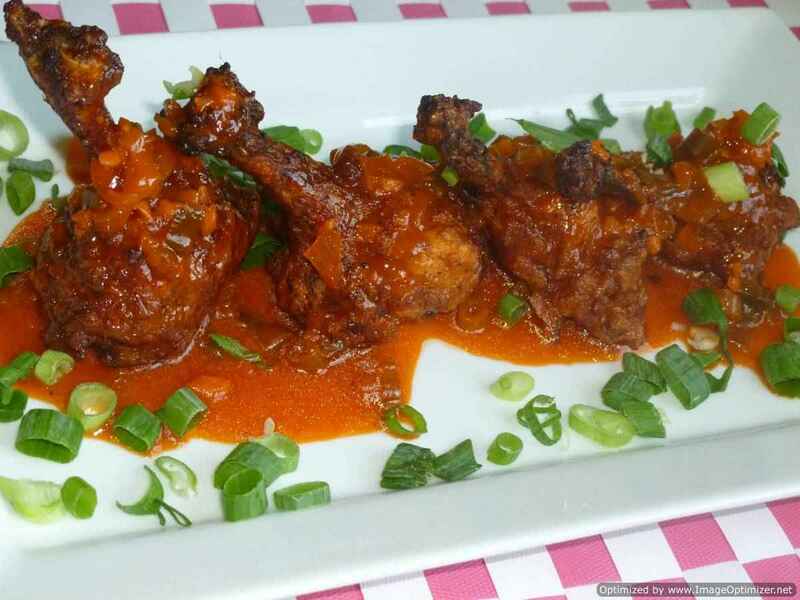 Chicken lollipop is an Indo-Chinese appetizer and is made from chicken wings. You can make chicken lollipop according to your taste and you can add your own spices. This dish is in a dry form and it can be eaten as a starter or any time you want. In this recipe, I have marinated the chicken with some sauces and other ingredients and fried directly. 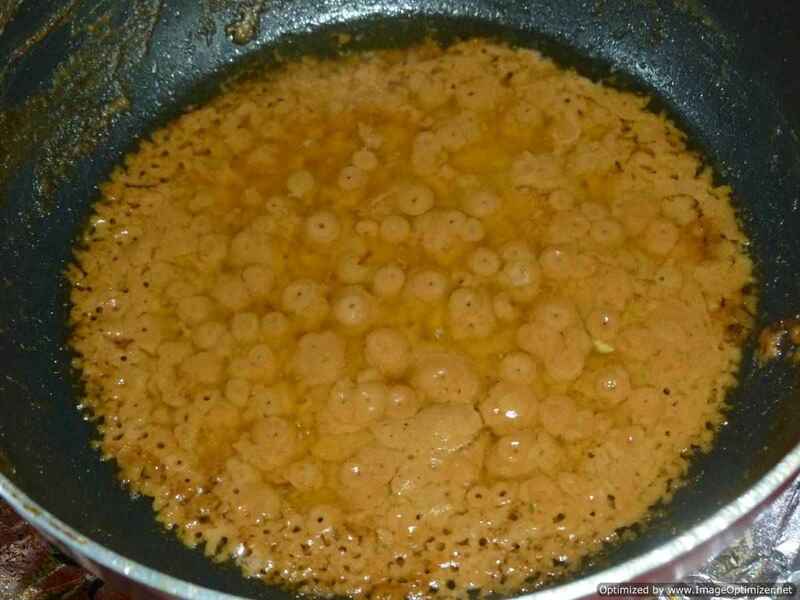 Unlike my other recipes, I fried the lollipops directly with the marinade instead of dipping the lollipops in a batter and frying it. I just wanted to have a different taste and texture. This is a Chinese appitizer and it is made from chicken wings. To give a lollipop shape, pull the thin layer of flesh and pull the flesh to the other end of the thick bone and make like a lollipop. In chicken lollipop you can add your own spices also and can make according to your taste. this is a dry form dish and it is eaten as a starter or any time you want. I will call my chicken lollipop as an Indo-Chinese chicken lollipop. In this chicken noodle, turmeric flavour will be more, though using oyster sauce or soya sauce. This easy and quick recipe. 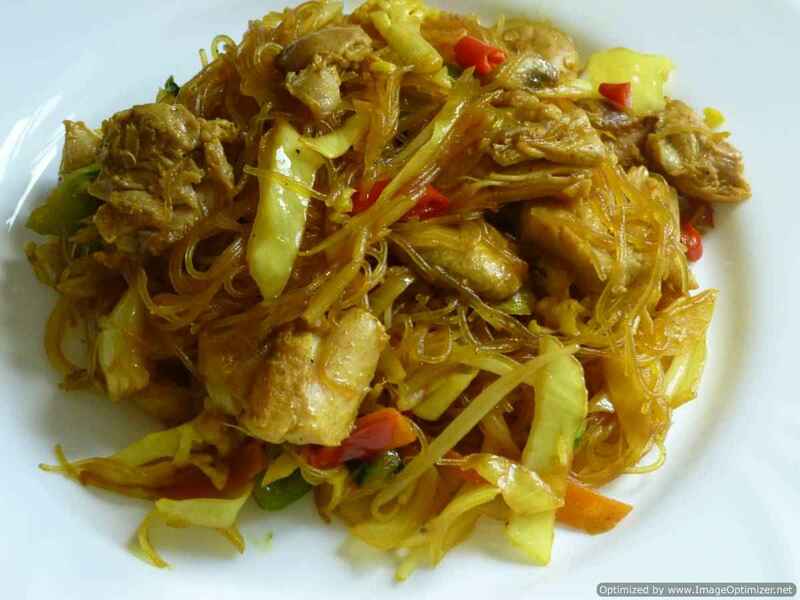 If you are able to get chopped Chinese stir fry vegetables and boiled rice noodles in the super store, it is more easy and quick, I will say more comfortable recipe on lazy days or any left over vegetables and left over roasted or boiled chicken is left, you can use this recipe. It is a one pan or one pot dish, but very quick. Chow mien in Chinese mean stir fry noodles, there are variety of versions in it. Each time when ever I visit some Chinese street food, I learn by seeing them or in restaurants where from a glass, you can view what the chef is doing. My main purpose is to share the recipes which are good and tasty. 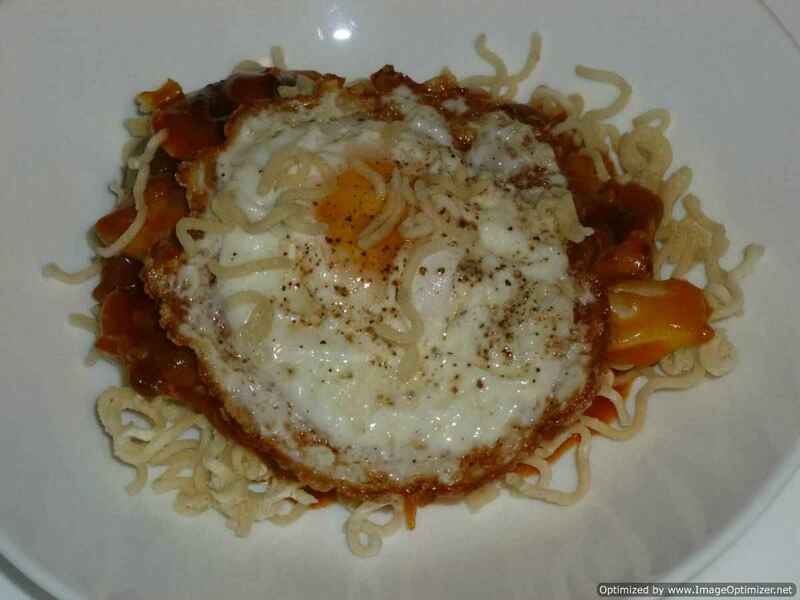 In chow mien noodles, I have often seen egg noodles or eggless noodles, you can use rice or any noodles you have. Each place I get different taste and texture. Bang bang chicken traditionally means pounding the chicken to make it tender. In bang bang chicken, the main ingredient is peanut sauce, served with rice vermicelli or mung bean noodles. 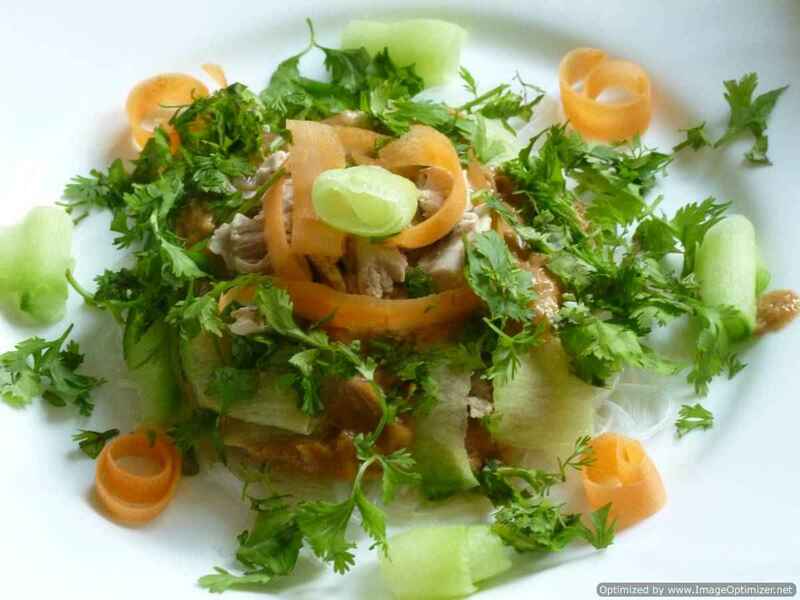 The ingredients in the bang bang chicken (Chinese) are similar to goda goda salad which is from Indonesian cuisine. This bang bang chicken can be served hot or cold. In the bang bang chicken salad, I have used simple boiled chicken, you can boil the chicken with some spring onion and ginger pieces or can fry it like me with pepper and dry chilli flakes. In Singapore you will find variety of stir fry noodles, each has different taste and different flavour. One among them is curry powder flavoured noodles. Most of the Singapore noodles prepared are in yellow colour which has turmeric in it. I have prepared my own curry powder for the noodles which gave different taste. You can use chicken, prawns or any meat you like but I have seen more of prawns. Chilli chicken noodles are spicy and flavoured with roasted sesame oil (use the dark colour ones). I love the taste of sesame oil and so I use often in my most of the recipes, it gives additional taste. The oil which we use in Tamil Nadu is gingelly oil (nalla enna, raw sesame seeds), do not use that oil, its colour is in golden and light colour where as toasted sesame oil is used for Chinese recipes. I have used egg noodles or eggless noodles for the chilli chicken; can use any noodles you have like rice noodles, Thai noodles or Magi noodles type. Peanut sauce or satay sauce is widely used in the cuisines of Thailand, Malaysia, Indonesia, china and many more places. The main ingredient for peanut sauce is crushed roasted peanuts but can substitute with smooth or crunchy peanut butter. In thai version, lemon grass, galangal or ginger, fish sauce or soya sauce, lemon juice or tamarind paste, coconut cream, red chilli are added as per the taste. Peanut sauce can be used as a dipping sauce, with salad, noodle, marinate and in spring roll as a stuffing. This time I have prepared peanut sauce with peanut butter (smooth). It is up to you how spicy and sweet you want. 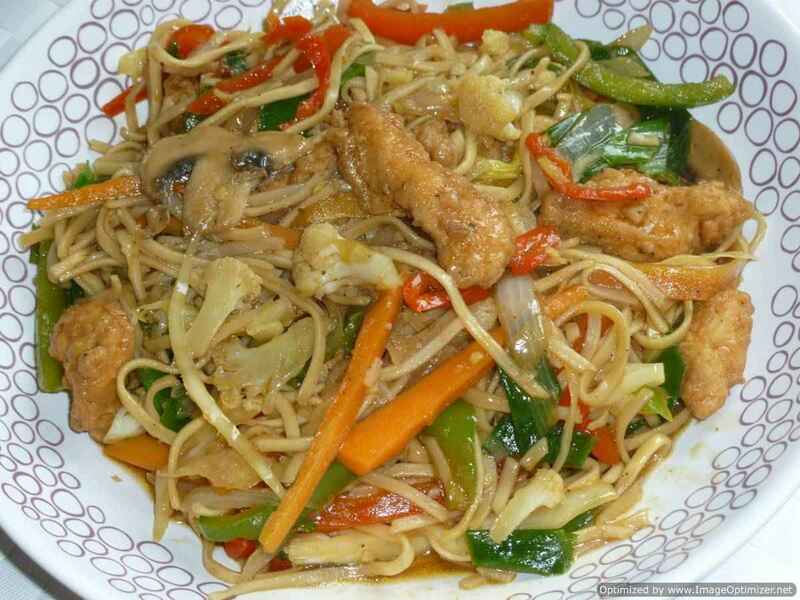 American chopsuey is a famous and most common dish available in Chinese restaurants in India. 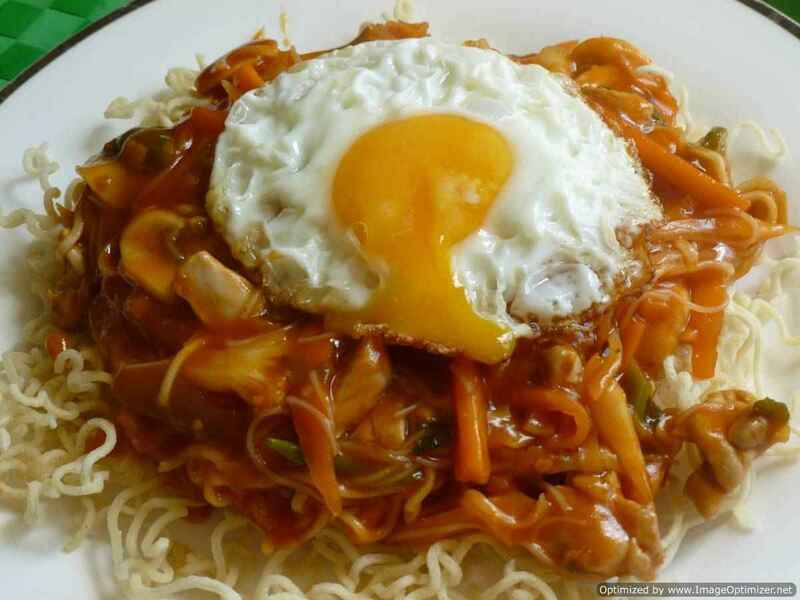 The combination of crispy noodles, crunchy vegetables and meat with sauce and egg makes very tasty and appetizing as a popular Indo-Chinese dish. The sauce made for the crunchy noodles is sour and sweet and goes well with our crunchy vegetables and crunchy noodles. In Singapore, you will find a huge variety of stir fry noodles, each with different taste and flavour. One among them is curry powder flavoured noodles with oyster sauce. Most of the Singapore noodles prepared are yellow in colour, which is due to the turmeric used in it. I have prepared my own curry powder for the noodles, which gave a different taste. You can use chicken, prawns or any meat you like, but I have seen a lot more of prawns in Singapore noodles. The Singapore noodles is made using rice noodles usually, but I have used maggi type or ramen type noodles. Noodles can be stir fried or prepared with a little soup as well. You can use any colourful vegetables that are also crunchy.